Crabgrass can be the ruin of a beautiful lawn. When left untreated, this weed can quickly take over the lawn and remain throughout the growing season. The chore of curing crab grass outbreaks begins in the early spring, lasts throughout the growing season and into the winter months. Aerate and dethatch your lawn in the early spring to increase air circulation and light penetration below the lawn’s surface. Aerate your lawn every spring. Dethatch your lawn every 2 to 3 years. Avoid removing all of the lawn’s thatch, as a thin layer protects the grass’ roots from sunburn. Aerate and dethatch your lawn in the early spring to increase air circulation and light penetration below the lawn’s surface. Aerate your lawn every spring. Dethatch your lawn every 2 to 3 years. Avoid removing all of the lawn’s thatch, as a thin layer protects the grass’ roots from sunburn. Treat your lawn with a pre-emergent crabgrass treatment in the early spring, just as the grass begins growing. Treat the lawn as temperatures approach 50 degrees. Apply the chemical thoroughly so that it reaches all areas of the lawn. Irrigate your lawn deeply so that the water reaches the lawn’s deepest roots. Allowing the lawn to dry slightly between each irrigation promotes a strong, dense turf. Maintain deep, infrequent irrigation and always adjust the irrigation levels for periods of drought and rain. Feed your lawn four to five times throughout the growing season, or about every six weeks. Begin feeding the lawn when temperatures reach about 45 degrees, as this is when grass begins growing. Feed the lawn with a slow-release fertilizer with higher levels of nitrogen. Scatter the feed evenly across the lawn and irrigate it deeply. Maintaining a proper blade length promotes a vigorously growing lawn. Remove no more than a third of the grass blade during each mowing session. Keep the lawn at approximately 3-inches high during the summer months. Reduce the height by about an inch in the spring and fall months. Cleaning the mower’s blades regularly decreases the potential of spreading crabgrass seeds across the lawn. 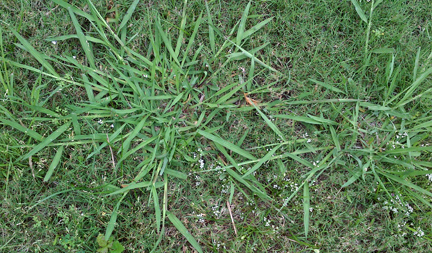 Inspect the lawn periodically for signs of crabgrass. 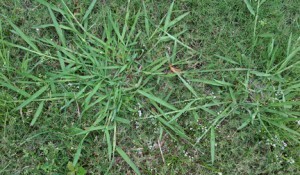 Remove emerging crabgrass as it appears. Pouring water on the surface of the crabgrass loosens the soil around its roots. Pull the crabgrass gently from the ground. Pull the entire root to prevent the weed from re-emerging. Give the lawn a final fertilization in the late fall. Include a pre-emergent application to treat the crabgrass seeds preparing to germinate the following summer. This entry was posted on Monday, June 2nd, 2014 at 12:30 pm	and is filed under News & Updates. You can follow any responses to this entry through the RSS 2.0 feed. Both comments and pings are currently closed.